Join your fellow philanthropic studies majors for a welcome back event on Monday, January 9, from 4:30-5:45 p.m. The event will take place in the first floor conference room at University Hall, Room 1006. 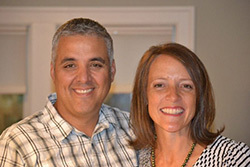 We’ll “ring in the new year” by hearing from an amazing couple – Beth Kreitl and Kevin Espirito. Beth has a background in career development on college campuses and Kevin was the Senior Manager of Employee Philanthropy at Microsoft, where they raised millions. They left their jobs because they felt “called” to opportunities in Vietnam. Come find out how they started Swim for Life Vietnam and Mindfulness Yoga for Empowerment. We’ll practice a little yoga to start the year off right. RSVP below and join us for food, fun and great conversation!